Being a bit of a while since I blogged. 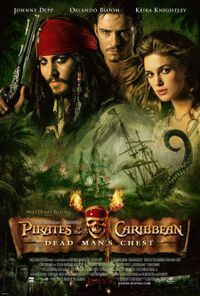 Yesterday evening found me, my sister and a couple of office mates watching Pirates of the Carribean – The Dead Man’s Chest at Atheena Cinema. Yeah you are right, it has been ages since the movie was released and finally us poor souls in Maldives had the opportunity of watching it. It was one of the most hilarious and glorious flicks I have watched recently and everyone present (which was a couple of handful of people) would agree with me. What bugged me was the fact that Keira Knightley never seemed to be able to make up her mind about whom she is going to get married to and spend the rest of her life with. Maybe its one of the stunts pulled by the directors to entice the ever eager fans of the movie until the release of the next part of the movie. And I for one, am dying to see how it turns out. ← Lawyer Jokes – Just for Fun!